If you were at our annual Camp Secure Sense this year, then you will remember the compelling presentation by Fortinet’s Senior Security Strategist, Aamir Lakhani. Lakhani spoke about the reality of digital breadcrumbs being left behind, without the realization. He also showed everyone about the dangers of selling your hard drives and devices online, and how most people unintentionally end up selling sensitive and unencrypted data. 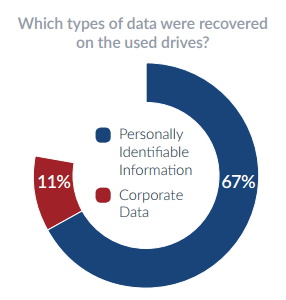 Another company looking into resold hard drives and their links to data breaches is Blancco Technology Group, who released a report this month titled The Leftovers: A Data Recovery Study. 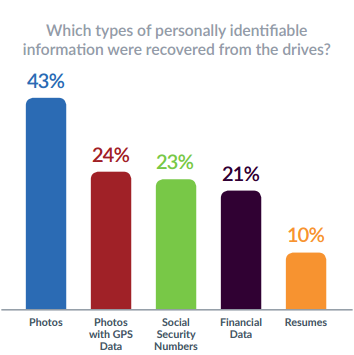 Like Lakhani, they purchased multiple devices on eBay and Craigslist, and analyzed each one to see if any residual personal and/or corporate data could be recovered. drives that were purchased, a staggering 78% still held residual data. Though these numbers may not seem too high, they are still alarming due to the sensitive nature. While some companies, like Sony Pictures, are able to bounce back from a data breach that stemmed from stolen credentials – other companies may not be so fortunate. Having any device out on the open market, that potentially has sensitive information on it, should be a major concern for every company. With this information, we encourage all organizations to properly sanitize their equipment before it’s resold, donated, traded or just thrown out. Ensuring that this step is monitored and obtaining verification that all data has been removed permanently, can save your company financial, legal and reputational damage. Connect with Secure Sense to protect data, your network, and systems 24/7, 365 days a year. If you have questions or want to learn more, please contact Secure Sense by calling 866-999-7506. You can find Secure Sense on Facebook, LinkedIn and Twitter. Follow us for current company and industry news.